I love love love Strawberry Shortcake. When I decided to enter the Grove Park Gingerbread Competition, Strawberry Shortcake was my immediate design. 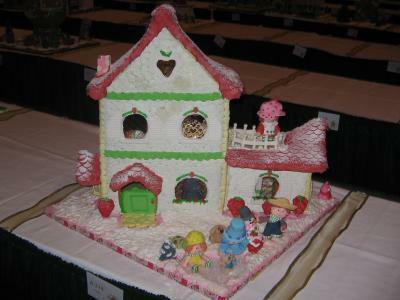 I designed my house after the original Strawberry Shortcake Berry Happy Home from the early 80's. All of the characters and furniture are made of gumpaste. It was about 100 hours of work. I loved every second of it. What a fantastic job! I own the original, and had to look twice. I thought it was the real thing! Is there anywhere I can go to see more pics? It is truly amazing! I think it is just fantastic! I have an original and it looks just like it. :) What fun! I can't believe how perfect this looks!